The Walking Dead wrapped up its Whisperer War story with only one major character having been killed (quite brutally, though). Six issues of war prompted the expectations for major deaths but the big players in Alexandria made it out unscathed. While issue #163 has set the stage for Alexandria to be destroyed and more characters to bow out, the writer and creator of Skybound/Image Comics' The Walking Dead Robert Kirkman has made a statement contradicting those expectations. According to Kirkman's comments in the Letter Hacks section of issue #163, there should be "much less" death going forward. "In my opinion, there should be less death in the book now, much less, because the careless people, the scared people, the people learning how to live in this world are already dead," Kirkman said. "This is the cream of the crop, so to speak. So, yes, there can be a conflict like the Whisperer War, and there can be very little death. 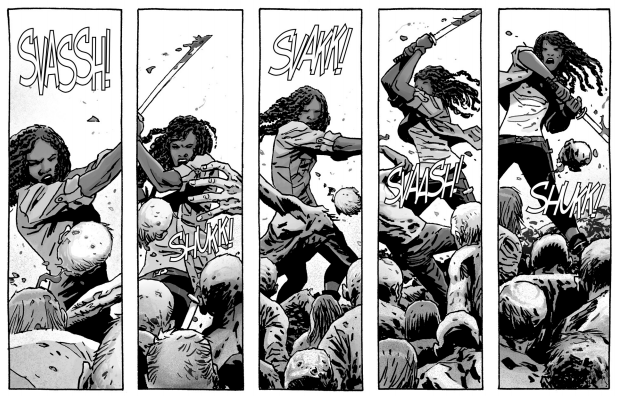 You think Michonne is going to just let herself get bitten by a zombie or stabbed by a Whisperer at this point? It wouldn’t be believable! Rick, Andrea, Carl, Jesus, Dwight, Negan, Maggie, these people are tempered steel! That’s not to say they’re invulnerable, or 'safe' now but it would take a lot to kill them." This might be a trick, as many time the Letter Hacks section has been used to mislead readers of The Walking Dead comics and Michonne and Jesus, both named in the comments, are currently surrounded by walkers and fighting their way out. However, it's also a valid point. The characters who have survived this far are hardened. They are not going to walk into the woods and let a zombie sneak up on them or hop into a gunfight with only a knife. A careful fan should keep in mind that Rick is currently being helped by Negan who can betray him at any moment and the rest of Alexandria is in peril, so people may or may not be biting it when issue #164 and beyond arrive. The same logic can likely be applied to television. The survivors throul six and a half seasons have become hardened by the world they survive in. Maggie, Rick, Michonne, Jesus, and even Eugene have experienced enough of the apocalypse to understand the basic requirements of survival. Walking with headphones through the woods at night is going to get you killed. Picking a fight with the wrong enemy will also get you killed. Be alert, be armed, and survive. It's what much of the group will likely do going forward. The Walking Dead issue #163 is on shelves at your local comic shop now. 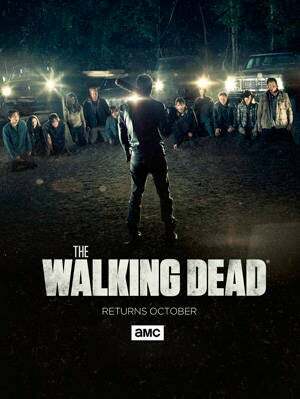 The Walking Dead returns for the rest of its seventh season on February 12 at 9 p.m. ET on AMC. Fear the Walking Dead's third season does not yet have a premiere date but with The Walking Dead finale set for April 2, expectations for Fear's return are set for April 9. For complete coverage and insider info all season long, follow @BrandonDavisBD on Twitter.